Another central agency changes hands as a call to dahm international brings news that Herbert Dahm has taken over the listing for the 41.6m sailing yacht Infatuation with a €1.5 million price cut. 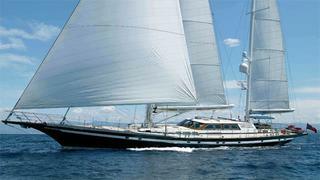 Built to Lloyds class by Jongert in 2004, Infatuation accommodates up to nine guests in four well appointed staterooms. The full beam owner’s suite has a large seating area and stunning bright ensuite bathroom. Further guest accommodation is provided by a double suite and two spacious twin guest staterooms, one with an additional Pullman berth. All have large ensuite bathrooms. Infatuation also boasts the Jongert patented folding keel that allows her to reduce her draft from 5.1m to 2.75m, making her the perfect choice to reach shallow ports. The yacht has an excellent combination of indoor and outdoor dining and lounging areas. The main saloon, which is both large and elegantly understated, has a formal dining area to one side and relaxing lounge seating to the other. Leading out onto the main deck there is another beautifully appointed lounge area and aft deck dining space. Infatuation is down from €8.5 million to €7 million.